These majestic birds of prey are awe inspiring. Their huge wingspan of up to 90 inches, ability to lift up to 4 pounds, visual acuity of up to four times that of humans and longevity of 20 years make these creature fascinating. I never tire of watching and photographing these beautiful birds of prey. This entry was posted on Saturday, January 26th, 2019 at 3:47 am. 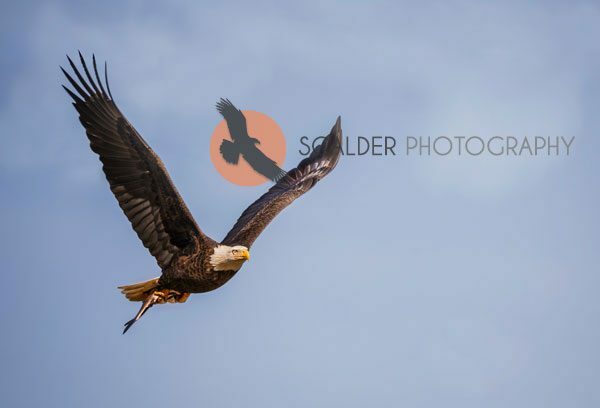 It is filed under Animals / Wildlife, New Images and tagged with Adult Bald Eagle in flight, Adult Bald Eagle in flight with fish, scalderphotography. You can follow any responses to this entry through the RSS 2.0 feed.